Many brides choose hydrangeas for their wedding bouquets and decorations, but using real flowers means they must be arranged and created (in the case of the bouquets) shortly before the ceremony because flowers only look fresh for a short time. Once a flower is separated from it’s water supply, it’s only a matter of time before it will begin to die. 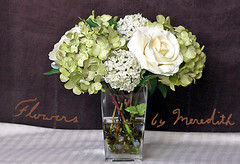 To do some decorating with hydrangeas yourself, maybe you would like to consider artificial flowers. We all know there are silk replicas of every type of flower, but I’ve come across an Etsy crafter who will create hydrangea flowers from paper according to the color you want for your event. If you don’t know what Etsy is, it’s a place online where people can show off their crafts and creations and sell them. Wanda at TreasuredEditions is the woman who makes the flowers, and if you are interested, there is contact info on her page to get pricing and all the details. Just thought I’d pass on another way to achieve the hydrangea look for your wedding or event.